Sharing is a key activity in SharePoint Online and OneDrive for Business, and it's widely used in Office 365 organizations. Administrators can now use sharing auditing in the Office 365 audit log to determine how sharing is being used in their organization. Sharing events (excluding sharing policy and sharing link events) are different from file- and folder-related events in one primary way: one user is taking an action that has some effect on another user. For example, User A gives User B access to a file. In this example, User A is the acting user and User B is the target user. In the SharePoint File schema, the acting user's action only affects the file itself. When User A opens a file, the only information needed in the FileAccessed event is the acting user. To address this difference, there is a separate schema, called the SharePoint Sharing schema, that captures more information about sharing events. This ensures that administrators have more insight into who shared a resource and the user the resource was shared with. TargetUserOrGroupName - Stores the UPN or name of the target user or group that a resource was shared with (User B in the previous example). TargetUserOrGroupType - Identifies whether the target user or group is a Member, Guest, Group, or Partner. These two fields, in addition to other properties from the Office 365 audit log schema such as User, Operation, and Date can tell the full story about which user shared what resource with whom and when. There's another schema property that's important to the sharing story. The EventData property stores additional information about sharing events. For example, when a user shares a site with another user, this is accomplished by adding the target user to a SharePoint group. The EventData property captures this additional information to provide context for administrators. Sharing is actually defined by three separate events: SharingSet, SharingInvitationCreated, and SharingInvitaitonAccepted. 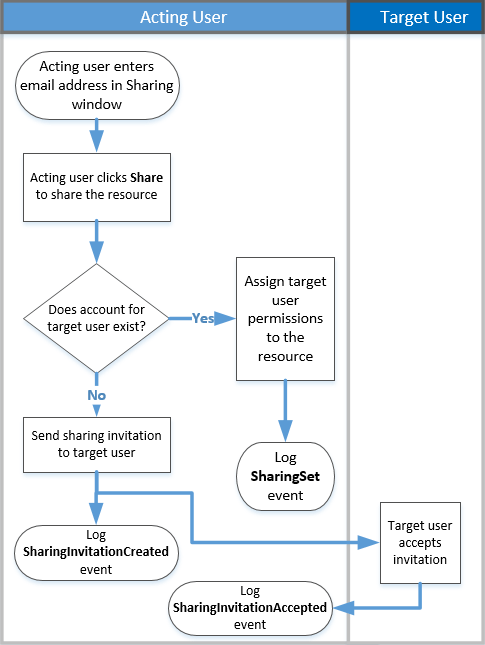 Here's the work flow for how sharing events are logged in the Office 365 audit log. Immediately assigns the target user permissions to access the resource. Sends a sharing notification to the email address of the target user. Creates a sharing invitation and sends it to the email address of the target user. The SharingInvitationCreated event is most always associated with external or guest sharing when the target user doesn't have access to the resource that was shared. 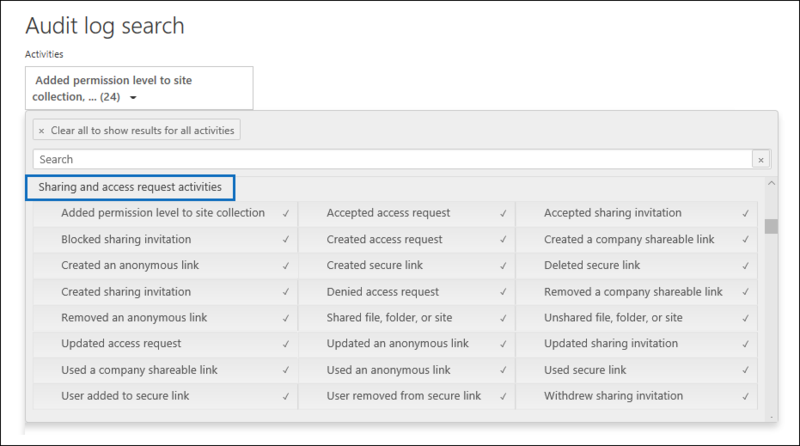 When the target user accepts the sharing invitation that's sent to them (by clicking the link in the invitation), SharePoint logs a SharingInvitationAccepted event and assigns the target user permissions to access the resource. Additional information about the target user is also logged, such as the identity of the user that the invitation was sent to and the user who actually accepted the invitation. In some case, these users (or email addresses) might be different. A common requirement for administrators is creating a list of all resources that have been shared with users outside of the organization. By using sharing auditing in Office 365, administrators can now generate this list. Here's how. The first step is to search the Office 365 audit log for sharing events. For more details (including the required permissions) about searching the audit log, see Search the audit log in the Security & Compliance Center. In the left pane of the Security & Compliance Center, click Search > Audit log search. Under Activities, click Sharing activities to search only for sharing events. Select a date and time range to find the sharing events that occurred within that period. Click Search to run the search. When the search is finished running and the results are displayed , click Export results > Download all results. After you select the export option, a message is displayed at the bottom of the window that prompts you to open or save the CSV file. Click Save > Save as and save the CSV file to a folder on your local computer. The next step is to filter the CSV for the SharingSet and SharingInvitationCreated events, and to display those events where the TargetUserOrGroupType property is Guest. You'll use the Power Query feature in Excel to do this. The following procedure is performed in Excel 2016. In Excel 2016, open a blank workbook. Click New Query > From file > From CSV. Open the CSV file that you downloaded in Step 1. The CSV file is opened in the Query Editor. Note that there are four columns: Time, User, Action, and Detail. The Detail column is a multi-property field. The next step is to create a new column for each of the properties in the Detail column. Select the Detail column, and then on the Home tab, click Split Column > By Delimiter. Under Select or enter delimiter, select Comma. Under Split, select At each occurrence of the delimiter. The Detail column is split into multiple columns. Each new column is named Detail.1, Detail.2, Detail.3, and so on. You'll notice the values in each cell in the Detail.n columns are prefixed with the name of the property; for example, Operation:SharingSet, Operation:SharingInvitationAccepted, and Operation:SharingInvitationCreated. 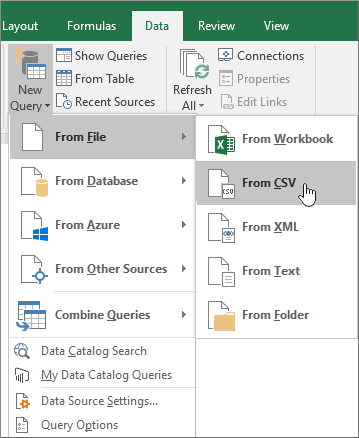 On the File tab, click Close & Load to close the Query Editor and open the file in an Excel workbook. The next step is to filter the file to only display the SharingSet and SharingInvitationCreated events. Go to the Home tab, and then select the Action column. In the Sort & Filter drop-down list, clear all selections, then select SharingSet and SharingInvitationCreated, and click OK.
Excel displays the rows for the SharingSet and SharingInvitationCreated events. Go to the column named Detail.17 (or whichever column contains the TargetUserOrGroupType property) and select it. In the Sort & Filter drop-down list, clear all selections, then select TargetUserOrGroupType:Guest, and click OK.
Now Excel displays the rows for SharingInvitationCreated and SharingSet events AND where the target user is outside of your organization, because external users are identified by the value TargetUserOrGroupType:Guest. The following table shows all users in the organization who shared resources with a guest user within a specified date range. Although it's not included in the previous table, the Detail.10 column (or whichever column contains the ObjectId property) identifies the resource that was shared with the target user; for example ObjectId:https:\/\/contoso-my.sharepoint.com\/personal\/sarad_contoso_com\/Documents\/Southwater Proposal.docx. If you want to identify when a guest user was actually assigned permissions to access a resource (as opposed to just the resources that where shared with them), repeat Steps 10, 11, and 12, and filter on the SharingInvitationAccepted and SharingSet events in Step 10.